Atal Tinkering Lab (ATL) was setup in the school under the aegis of NITI Ayog in October 2018. ATL of our school provides dedicated work space wherein students get a platform to develop and hone their analytical, innovative and scientific skills. Students from classes IX to XII are enrolled as members of the ATL club and are under the guidance of the teacher-mentor, Ms. Komal Saini. The projects - Line Following Device, 3D Hologram, Self-balancing Robot, Drones, Racing Remote Control Assisted Car - have been completed. During the class room sessions, students learnt working and applications of Open Electronics, Basic Components of Electronics, LED, Push-button and its Role, RGB LED, Potentiometer, 3D Printer’s Functioning and Programming, Sensors and their Applications in different working devices. Theatre in Education Workshop was organized on 11 December 2018 for the teachers of the Primary Department. 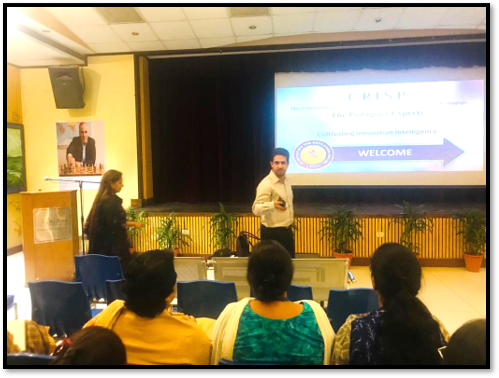 It was conducted by the resource persons, Ms Rekha Sharma, Advisor, CES and Ms Sonia Chhabra, HM, Primary Department, Pitampura. 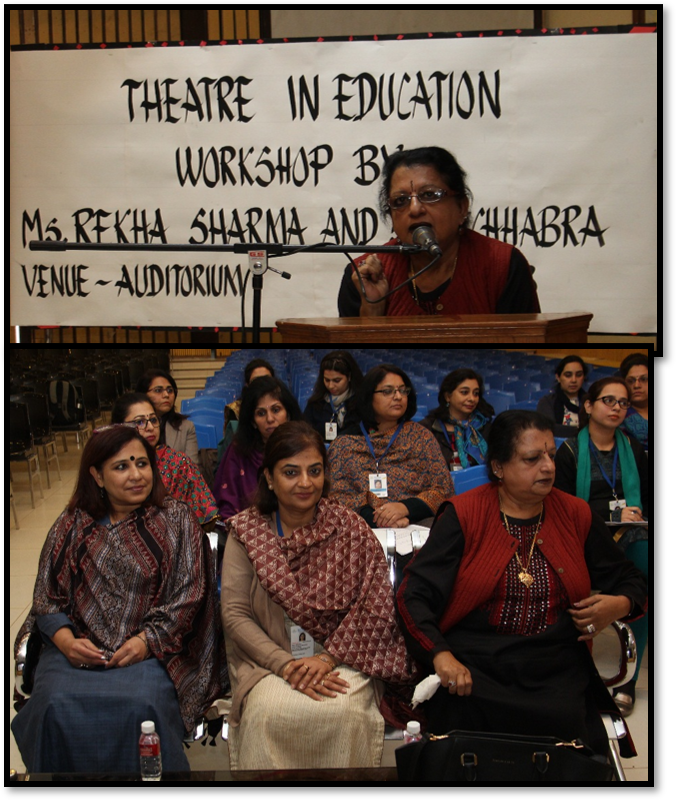 Ms.Rekha Sharma highlighted the importance of drama in our lives and theatre as a process that supports education through interactive practices . Ms Sonia Chhabra talked about the ways to incorporate Drama in school curriculum and proposed a detailed plan of action. Under the MASP, Microsoft accounts for the students of Class III were created and made operational. The students can now participate in various online learning initiatives designed by Microsoft as well as take the varied Microsoft Certification Exams at a discounted fee. Consortium for Research and Innovation in School Pedagogy (CRISP), has provided a platform to enhance the technological know-how of teachers and students simultaneously. This Connected Classroom Programme as devised by CRISP will equip the teachers to research, select, assort and create videos, presentations and other informative resources pertaining to the curriculum which could be accessed by the students easily at homes. 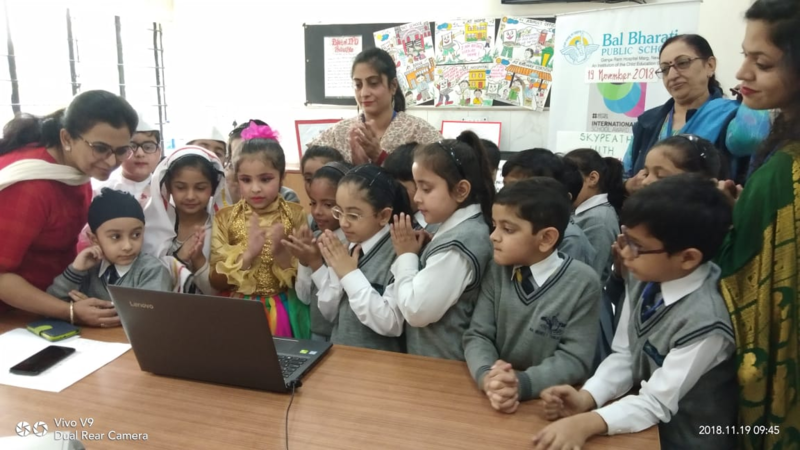 Inspired by Skype-a-Thon a global learning event by Microsoft which makes it possible for students to virtually travel around the world and connect beyond the classroom, a Skype Interaction was organised for the students of Class III on 19.11.18. The initiative was a part of the activities organised to mark the Children’s Day celebration at the Primary Department, Pusa Road Campus. The students got an opportunity to interact and exchange thoughts with their peer group at Bal Bharati Public School, Manesar. The theme chosen for the Skype Session was Children’s Day. The session focused on the importance of Children’s day and life of Pandit Jawahar Lal Nehru. The presentations included a short play and a poem by the students of Manesar Unit and a role play, poem, song, dance performance and short narrations related to the life of Chacha Nehru by our students. The students also participated in a quiz related to Pt. Jawahar Lal Nehru. The interaction was a very enriching experience for all and showcased how embracing technology can make learning and exploring fun for children. The children of today are gearing up to become adult citizens of tomorrow therefore it is imperative that school education must focus on the various aspects, which contribute immensely to the development of the young minds as they step into adulthood. At Bal Bharati it is our constant endeavour to provide our students with opportunities to empower them to become active participants in the transformation of the society as future citizens. 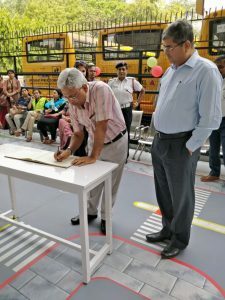 The school was honoured to have Dr. Satish Chandra, Director, CRRI as Guest of Honour to inaugurate the Traffic Training Arena at Pusa Road Campus for our young learners. The initiative was proposed by Ms. Reetu Dawar and the Road Safety NGO: TRAX was then contacted. We have been working with this NGO since 2015 for the Safer Roads, Safer India project. Mr. Anurag Kulshrestha, President, NGO TRAX, the sponsor of the event and other esteemed members from TRAX, Ms. Rajni Gandhi, Mr. Sunil Mishra and Ms. Deepali Srivastava were also amongst the guests along with some senior scientists from CRRI. 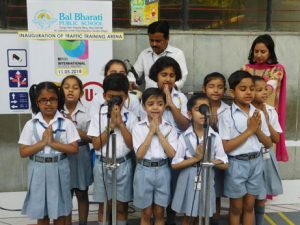 We were also grateful to Ms Pushpal Kaur (SI) Delhi Traffic Police, Road Safety Cell for gracing the occasion. 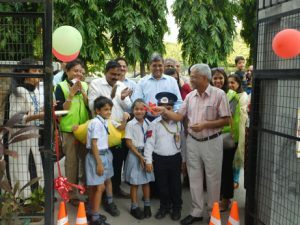 The school Principal , Mr. L .V Sehgal applauded the efforts of the Headmistress and teachers associated with this project. As per the CBSE guidelines ( Circular No.- Acad 05/2018 dated -8 February 2018), ‘The International Mother Language Day' -Matrubhasha Divas which is a worldwide annual observance to promote awareness of linguistic & cultural diversity and promote multilingualism, was celebrated by the Primary Department at the Pusa Road Campus on 21.02.18. To mark the occasion a host of activities was organised. These included a cultural fiesta wherein the students presented folk songs in different regional languages of India. Under the aegis of the Vernacular Club of the school the students learnt to write the word 'Indian' in different regional languages. The beautifully calligraphed work of the students was also exhibited on the occasion. The authentic cultural and linguistic experience made the students aware and proud about the fact that they live in a country that speaks 26 official languages and 724 recorded dialects. Learning by Seeing is also as effective as the principle of Learning by Doing.Children of Pre Primary observed the school carpenter and electrician work with their tools. They were familiar with the names of the tools used by them and were fascinated to see those tools in actual. This strategy has proved extremely beneficial in fortifying “book learning” as it triggered young minds to corelate the theoretical with the concrete. 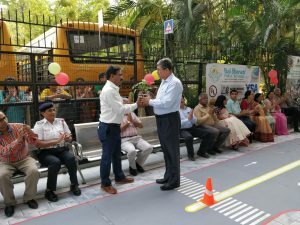 The Primary Department, Pusa Road Campus signed up for ‘Outdoor Classroom Day’, a global campaign to celebrate and inspire learning and playing outside the classroom. It is a day on which thousands of schools across the globe take outdoor lessons and prioritise playtime keeping in mind the importance and impact of outdoor learning. Under the aegis of the project a host of activities and outdoor lessons was planned for the students of Classes I-III on 12 October, 2017.The activities aimed at engaging the students in outdoor learning to facilitate connection with nature and develop critical skills like resilience, teamwork and creativity. These included an outdoor ’Card Making Activity’ for class I students wherein they made beautiful cards on Diwali and Christmas in the school garden. The students of Class II were engaged in an outdoor ‘Rangoli making Activity’. Drawing inspiration from the nature the students made beautiful rangoli designs using paper motifs and cut outs. A craft activity ‘Decorative Frill Making’ was planned for the students of Class III and conducted in the school's playfield. The students used their imagination and artistic skills and made colourful and beautiful frills using papers strips & cut outs, ribbons, strings, mirrors and other decorative material. A drawing and colouring activity was also organised for the students of Classes I- III. Theme for the activity was ‘Landscape Drawing’. The students captured the picturesque images of the school garden on their drawing sheets using vibrant colours. C. Treasure Hunt : A ‘Treasure Hunt Activity’ was also planned for class III students. The teams were given clues in the form of riddles which guided and lead them to various destinations in the school campus like the computer room, dance room etc. The teams had to answer a set of questions to reach to the next clue. These questions were aimed at assessing the students’ awareness about their surroundings and school campus. The final destination was the school playground. The team representing Class III F was declared as the winner of the activity. All the activities planned were aimed at providing a joyful and memorable learning experience to the students and enhance skills like teamwork, sharing & caring in them.The students actively participated in the activities. The school has become a member of the program, 'Seeding Journalists', launched by Nurturing Young Seeds (NYS), a part of Essel Group, Zee Media, to introduce students to the world of Journalism. An Orientation Programme was conducted by the NYS team members to apprise students about various aspects of the programme, in the school auditorium, on 2 May 2017. Twelve students from classes VII to XI have enrolled for the four-week long programme that promises to provide hands-on experience in Journalism, including exposure to Anchoring in Zee News Studio; conducting interviews of various personalities etc. The first session of the Programme was held at Zee Studios on 18 May 2017. In addition to the interactive session, the students visited different studios of Zee TV and saw the news being telecast live etc. They also met different journalists and interacted with them. The second session was held on 11 July 2017 in the school premises and focussed on conducting interviews. Overall, this experiential learning programme aims to enhance their creative, literary and oratorical skills besides building confidence and other soft skills of the students. On 18 May 2016, a meeting was held with Mr. Jean-Pierre Faou, Principal Lycée français de Delhi, French Embassy School and Mr. Nicolas Sokoloff, Chairman, Governing body of the French Embassy School in presence of Vice Principal, Ms. Geeta Gangwani, Head Mistress, Ms. Meena Malhotra, Administrative Officer, Mr. R.P. Singh and TGT French, Ms. Aarti Singhal. The meeting focussed on sharing the structure, working and curriculum of both the schools to explore the possibility of future partnership and collaborative projects. Fine Arts students of class XI and XII were encouraged by Ms Suchismita Sahoo, PGT Fine Arts , to create awareness regarding Social issues through an activity ‘Innovative Footprints.’ In groups, students selected various themes, such as, Save Environment, Save Girl Child, etc and using diverse art material showcased their ideas creatively on canvas shoes. The vibrant artistic rendering of the social issues was much appreciated. One wall in the Senior Library has been aesthetically painted by students of Fine Arts of classes XI and XII under the guidance of PGT Fine Arts, Ms. Suchismita Sahoo. Under the guidance of Vice Principal, Ms Geeta Gangwani, students of class IX were guided to prepare Comic Strips based on their understanding of selected concepts of Chemistry using the online software Toondo.com . The Computer Department innovated to enhance the IT Skills of the students of class IX. They were guided to complete an online Certification of their choice available on the website, Hour of Code. Students have been enthusiastically undertaking various courses and submitting the Certifications. Vernacular Club has been initiated in the school to promote different vernacular languages of India. The Inauguration Ceremony was held in the Junior Library on 10 May 2016. Students from classes III to X showcased performances in various vernacular languages namely Telgu, Punjabi, Marathi, Rajasthani, Sanskrit etc. 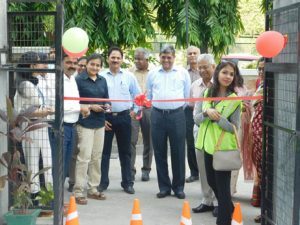 Mrs Mangala Kavthekar, Chief News Editor and News Reader in All India Radio and DD News, graced the occasion as the Chief Guest. School has undertaken the challenging task to ensure 100% participation of all students in Sports. To achieve the same in the session 2015-16, Sports Day is being held for each class on specified days. It is mandatory for each student to participate in at least two events as per their choice. Students can choose from Badminton, Basketball, Chess, Long jump, Shot put, Throw ball, Volleyball and Fun Games. To promote indigenous games, the school organised a Kabaddi Competition at Inter House level for Boys of Senior Department on the eve of Independence Day, i.e. 14 August 2015. The event saw enthusiastic participation from students as participants and audience, alike. raising public awareness about road safety. educating their peers and community members to increase safe behaviors. 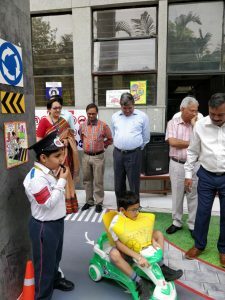 leading community service projects that engage volunteers in addressing road safety issues and advocating for policies to increase road safety. A horticulture project, 'Hamari Bagiya' has been initiated at PR Campus to create environmental awareness. The garden shall be maintained by students of classes II and III who have been guided to prepare colourful pots out of used tin cans; and watering cans from used water bottles etc. Students are also being sensitized about effective waste management and for the purpose, a compost pit has also been made. To mark the inauguration of this project, a Plantation ceremony was held on 1 October 2015. The Sports Authority of India National Academy (SAINSA) has collaborated with BBPSGR to provide education to the selected trainee swimmers enrolled with it. The students selected for admission in SAINSA in the academic session 2015-16 will be relocated to Delhi and will continue their education in BBPSGR. The school will support these students in achieving excellence in sports as well as academics. The Image Editors Future Leader Program for the newly appointed Student Council was organised in 4 sessions of 90 minutes duration each in December 2014. The Program was conducted by Image Consulting Business Institute. The programme was delivered in classroom setting and involved highly interactive sessions with audio-visual demonstrations and role plays. The objective was to hone leadership skills with effective body language and communication skills. School has initiated a programme to mentor 32 weak students of class IX from November 2014. Eight teachers have been made mentors to a group of four to five students each. The aim is to identify reasons for their poor academic performance and address them accordingly. 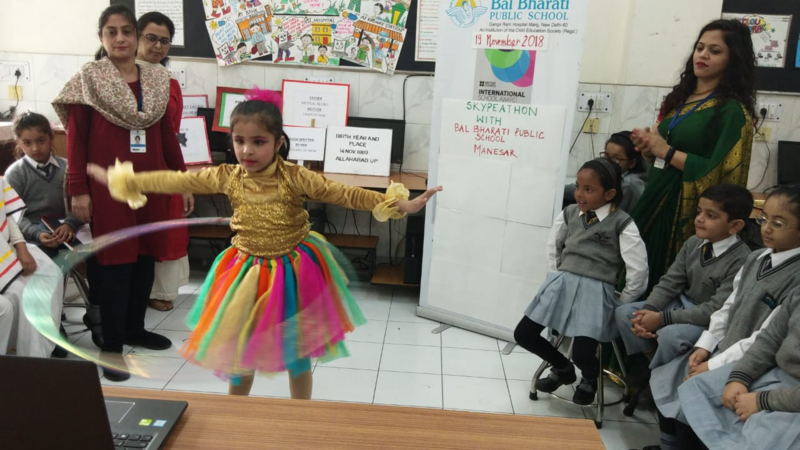 Bal Bharati Public School, GRH Marg was accorded the privilege of hosting the "Learners' Dance Competition", during the Literacy Week Celebration, under the aegis of Delhi Schools' Literacy Project. The event was held on 9 September 2014 in the school auditorium. The programme provided an opportunity to learners from deprived communities to showcase their talent. Padam Shree Ms. Rajni Kumar, Honorary Adviser DSLP, was the chief guest. The occasion was also graced by the presence of our special guests, Ms P Loomba, Honorary Secretary, DSLP; and Ms. Ritu Verma, Assistant Coordinator, DSLP. Rajsthani dance by learners of Bal Bharati Public School, GRH Marg bagged the second position. The Awakened Citizen Programme by Ramakrishna Mission, Delhi for students of class VII is being conducted by trained teachers- Ms. Jyotsana Srivastana and Ms Soma Ganguly to inculcate values in the children. The programme started on 14 July 2014. Sixteen sessions of 45 minutes each will be held during the current academic year. School in collaboration with Quality Education Asia has started the iSmart life skill programme for class VIII. The sessions that were held from 6 August to 8 September 2014 covered topics - How to emerge as a winner, Self Esteem, External factors that affect Self Esteem and Boosters of Self Esteem. The strategies used were Group discussion, Video presentation, Role play and Story narration. Self Assessment sheets helped the students to know their strengths and weaknesses. Parents were also invited to attend sessions and their feedback is positive. School in collaboration with "Envision India Eduservices" has initiated the 'ASPIRE' life skills programme for students of class IX. Through life skills programme, the school aims to develop a cadre of empowered, educated and healthy adolescents, capable of making decisions in life. There will be six workshops of one and a half hour duration each, in October and November 2014. The workshop will be conducted on weekly basis within school timings and will focus on topics-Enhancing self confidence, Time management & prioritization, Positive attitude for success in life, Communication skills for effective relationships, Self discipline – a key to success, Team spirit & cooperation. BBPS GR in collaboration with e-Dreams Edusoft Private Limited, Bangalore has initiated the 'Funtoot' programme for students of classes III to VIII w.e.f September 2014. 1200 students have been enrolled for the same. The teachers will teach and then assign Mathematics topics to the class for practice at home. The children can then practice the given topic through Funtoot.FUNTOOT, programme of individualized Mathematics learning, has recently launched 'Revision' feature, specially for our school, that allows students to revise and attempt questions of the topic, chosen by the teacher. The teacher can add more questions to the Revision Module as per requirement and then let the entire class attempt the same. The questions in the Revision module reinforces the concepts, and helps in the preparation of examination. Physical Education cards are made by CBSE as a competent tool for providing inclusive and interesting experiences to the school children at primary school stage and facilitating the process of engaging them intensively in games and activities focusing particularly on agility, balance, co-ordination, speed and strength. Along with this, each activity is related to their academic subjects like Maths, EVS, and English. It provides better understanding even to children who are differently abled. These activities are done under the guidance of Physical Education teacher and the concerned subject teacher whose activity has to be performed. It incorporates both learning and enjoyment for students. As a part of Swami Vivekananda's 150th Birth Anniversary celebration, Rama Krishna Mission, ND has taken the initiative to develop a comprehensive three year graded Value Education Programme. The aim of the programme is to equip students with important life skills and empower them to develop as enlightened citizen. The programme is to be started from July 2014 for students of class VII. 16 sessions will be conducted during the year on specified topics - Being Heroic, Living in Harmony etc. Under the School TV - a Video Educational School Programme, launched by NDTV, the school has purchased NDTV Media Kit consisting of a Professional SD/HD Camera and other equipment for videography. 40 students from classes VIII, IX & X were trained by NDTV professionals from 8-10 July 2013. This programme aims to provide a unique opportunity to students to enhance their communication and creative skills through video production. The school has entered into a tie-up with Music Valley corporation for preparing the school band. Enrolled students will be trained to play musical instruments like bagpiper, drums etc. Played in a group, it would develop unison and team work, while at an individual level musical skills of the students would be honed.